After a weekend off for the Thanksgiving holiday, eight conference members are back on the ice this weekend. 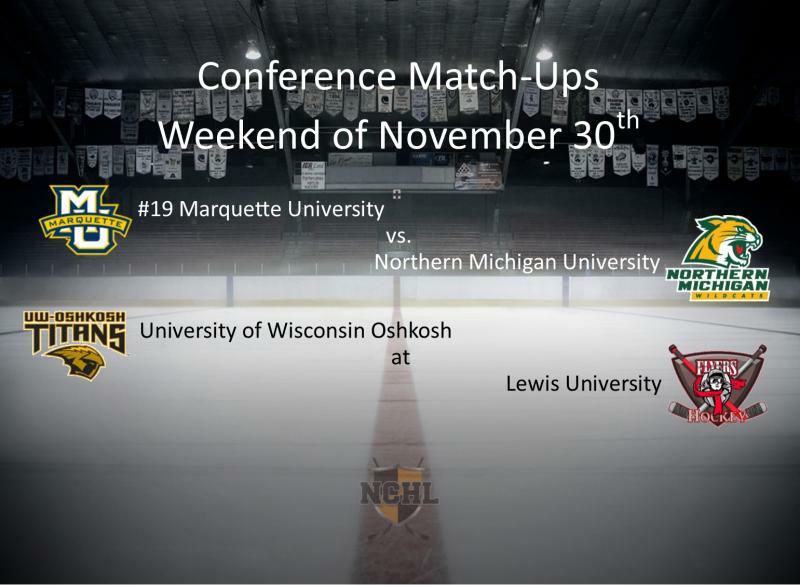 Highlighting the weekend series are conference contests between #19 Marquette University and Northern Michigan University and Lewis University and University of Wisconsin Oshkosh. The University of Wisconsin Oshkosh goes on the road to face Lewis University, their first true road series in two months. Meaning they will be playing on hostile ice for two nights in a row, which will be a test for them. Both teams come into this series having last seen game action during the weekend of November 9th, so they are on equal footing and the first team to shake off any rust will have the advantage. Taking part in non-conference series this weekend are #1 Marian University, hosting #4 Grand Valley State University, #20 Aurora University, in a home and home with #12 Adrian College, Concordia University, traveling to University of Pittsburgh, and DePaul University, hosting #3 Lindenwood University. In the latest D2 Central Region rankings Marian University still leads the pack in the #1 position. Marquette University has jumped up to #19, while Aurora slipped seven places, down to #20. Northern Michigan University heads on the road to face #19 Marquette University in Brookfield, WI this weekend. Having climbed up to the #19 spot in the D2 Central Region rankings this will be Marquette’s first series as a top 20 ranked team. They bring a lot of confidence into this series, having swept Aurora University, who were then ranked #13, two weekends ago. The sweep also has them sitting in second place in the conference standings, only two points behind #1 Marian University. With this their second to last conference series of the season every point they earn is important as most teams still have eight to 10 games remaining. This series marks the start of the second half for NMU and a new beginning. The first half of the season was not too kind to NMU, as they went winless in conference play. To get back on track they will have to solve their troubles finding the back of the net, while also improving their -54 goal differential. Last season Marquette and NMU met twice, with Marquette emerging victorious in each contest by scores of 9-2 and 9-3.